Move outside the heart of Paris and you quickly arrive in areas that were previously small suburban towns and villages. Some of these are well-known today and have moved upmarket, such as Belleville, Montmartre and Batignolles, but in my opinion the one which has managed to keep its original identity the most is Charonne. This is all the more surprising when you consider that huge towers today constitute one edge of this ‘village’! The best way to appreciate this area is to walk up the Rue de Bagnolet from M° Alexandre Dumas until you arrive at the XIIth century Romanesque Eglise St Germain de Charonne, one of only two left in Paris with an adjoining cemetery. If I want silence, nowhere in the city is better than a bench in this bucolic spot. After a quick rest, hop over the road to the Rue St Blaise, a small cobbled street on which a selection of bars, restaurants and artists studios have now settled. 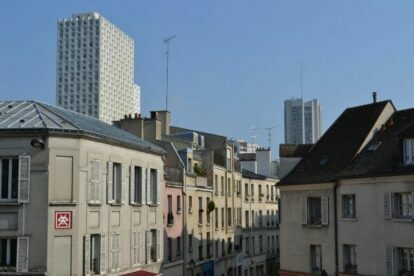 As you arrive at the end, the towers loom up in front of you but veer right here through the Rue Vitruve and Rue des Pyrenees until you arrive on the Rue des Haies, possibly the most authentic working class street left in the city.